The backbone of the North American trading relationship - the North American Free Trade Agreement (NAFTA) - is under threat. The Trump administration has repeatedly threatened to withdraw from the 23 year-old agreement and has now pulled the trigger on renegotiations. U.S. states and Canadian provinces have developed highly integrated and efficient supply chains. Canada is the largest buyer of exports from 35 U.S. states. Canadian products sold in the United States contain an average of 25 percent of U.S. value-added content. Mexico plays a key role in these supply chains as a production and investment partner and as a growing consumer market. With NAFTA negotiations looming and threats of new trade barriers being introduced, the future of the Canadian-American economic and trade relationship is uncertain. Will Canada retaliate against threats to established supply chains? Should Canada be pursuing new global trading partners in case the NAFTA falls apart? Will Canada and Mexico continue their trading relationship? Are there new prospects for cooperation that should be explored by all three partners to build North America’s competitiveness in the world? 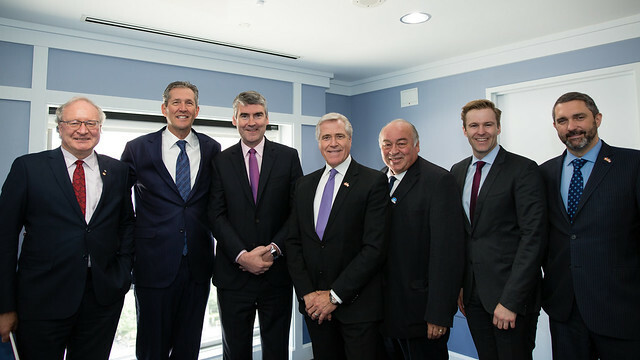 On June 8, Canada Institute Director Laura Dawson hosted a group of Premiers from across Canada to talk about the country’s potential negotiating objectives and strategies in the upcoming talks. “I want to see the proposals from my partners before I sign on in a hurry. I understand the benefits, indisputably, of resolution of discord and the certainty of capital flowing to areas of greater security and confidence. Absolutely, we all agree on this. But, I’ve seen people bully in negotiations before, and I don’t take kindly to that. I would say, fundamentally it’s a question of our belief in, and understanding of, the benefit of rules-based trade." “We’re not opposed to having NAFTA looked at. I think the fact that this agreement has been here for 25 years – it’s quite remarkable that we haven’t done that. If you look at yourselves personally, professionally, what relationship do you have that hasn't changed in 25 years? Let’s modernize it. Change is not bad. Let’s look at the opportunities for our respective countries."